For those of you familiar with Hyper-V or virtualization, feel free to skip ahead. For anyone else, this section will provide some context to the issue at hand. To begin, Hyper-V is Microsoft’s version of virtualization software. One comparison would be VMware’s ESXi. There are plenty of reasons why a business might use virtualization, such as to lower costs, perform testing, make backups, and more. Lower cost is one of the most tangible benefits, as you are able to run multiple operating systems from the same machine, reducing the physical space, cooling, power, and management expense that would be required of multiple computers. It is also easier and less expensive to migrate virtual machines (VMs) to upgraded hardware because there are no software or operating system installations/configuration to do, you just pick up the whole virtual machine and move it. So Which Hyper-V Check Box is Problematic? 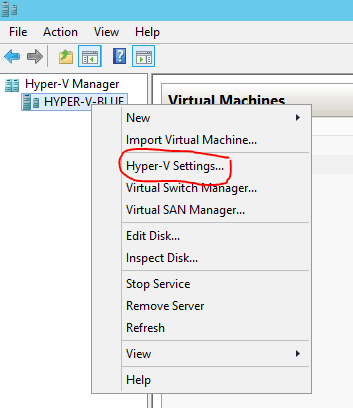 When using Hyper-V, there is a management portion that allows you to oversee the operation of all the virtual machines in each Hyper-V server you have running. Hyper-V has a “Checkpoint” feature that allows you to freeze the entire virtual machine at a particular moment in time. This is a great feature with many practical uses. For example, you could use it before performing a major upgrade of software on the VM and be able to go back to exactly where you were if things go sideways. When managing a particular Hyper-V server, you are able to easily revert back to a previous checkpoint if you need to. Again, this means the server jumps back to a point in time before whatever issue or mistake occurred that is forcing you to revert. While Checkpointing is a great feature, there’s a check box in the user interface that is very dangerous and should never be used. When you right click a VM and select Revert, in the bottom-left corner of the confirmation dialog, there is a check box that reads “Please don’t ask me again.” Should you choose to check this box, all future checkpoint reverts will happen without confirmation and will occur as soon as you hit revert. You might assume that the “Please don’t ask me again” check box applies to just the VM selected and you may be tempted to select it if you’re working with a test VM. Don’t do it. ALL the VMs in the particular Hyper-V server are affected by this setting, so the potential for mistakes increases dramatically. To add to the dilemma, notice how the Revert item sits right below the Checkpoint item. This isn’t inherently bad, but due to human error such as an accidental click onto the revert option, your server will experience some unsolicited time travel and valuable work will be lost! 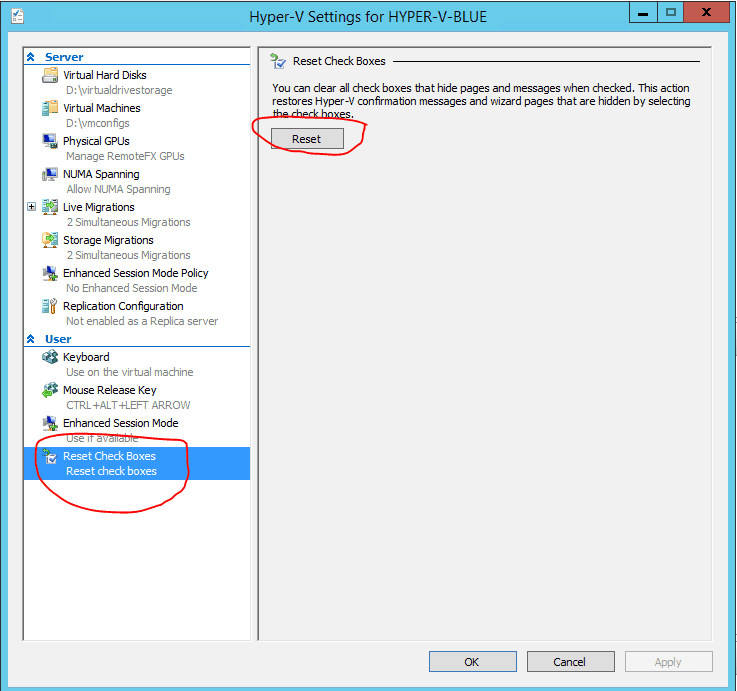 If you are running multiple Hyper-V servers from the management console, the “Please don’t ask me again” check box will only apply itself to a single Hyper-V server, that is, whichever one you were reverting at the time. There are other similar “Please don’t ask again” checkboxes in the Hyper-V UI and we don’t recommend clicking any of them. Can the Confirmation Dialogs Be Brought Back? Fortunately, yes they can. To do so, open the Hyper-V settings and scroll to the option that reads “Reset Check Boxes.” Click on it and use the button titled “Reset.” Now that you have reset the check boxes, the default confirmation dialog will appear again whenever you try to revert, whether accidentally or on purpose. Of course there will always be exceptions to the rule, but in general, most people should never check “Please don’t ask me again” in the context of Hyper-V Checkpoints. The potential cost is much greater than any benefit derived from it, and when data loss is on the line, always err on the side of caution. Remember, if you’ve experienced data loss in a virtual environment, Gillware can help.